A superb slice of British cuisine. 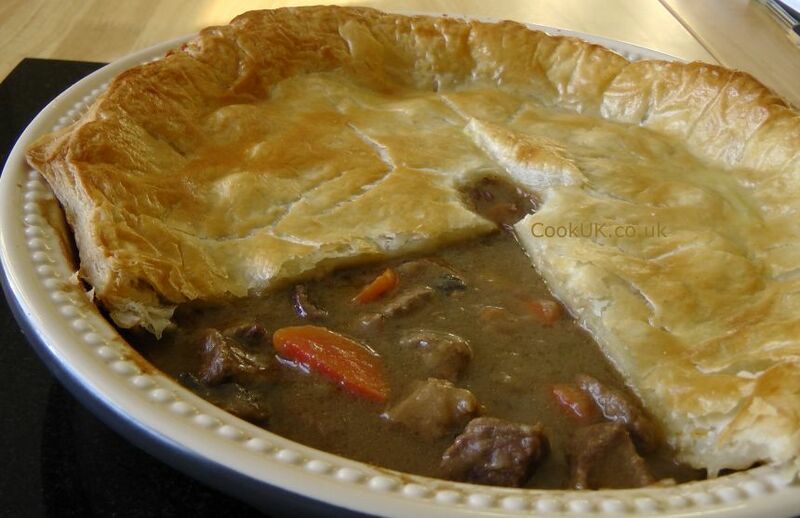 Our steak and kidney pie recipe is easy to follow and gives top class results every time. 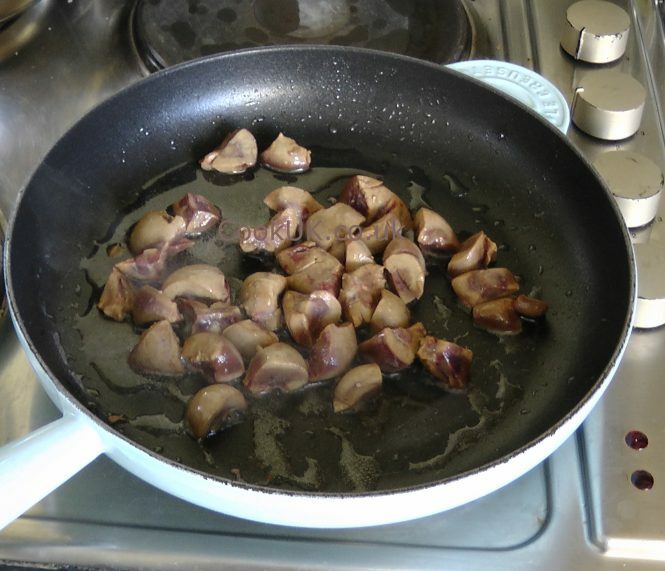 150g / 5½oz prepared ox kidney (see Cook's notes below for alternatives). If buying unprepared kidneys then buy 225g to allow for wastage. Peel and top and tail the onions. Chop them finely. If the ready made puff pastry is frozen, start to defrost it. The remainder of the preparation below can be done while the steak is slow-cooking. Chop the kidney into small cubes (see Cook's notes above if you need to prepare kidneys for cooking). Peel and slice the carrot and the mushrooms. Steak and Kidney Pie can be as simple or as complicated as you want to make it. 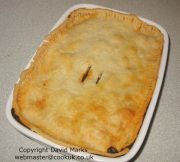 This recipe is of the simpler type but, trust CookUK, it has all the flavour of the best steak and kidney pie. First, we use ready made puff pastry. Handmade puff pastry is near impossible to make well whereas the ready made type comes out perfectly every time. One word of warning regarding ready made puff pastry. 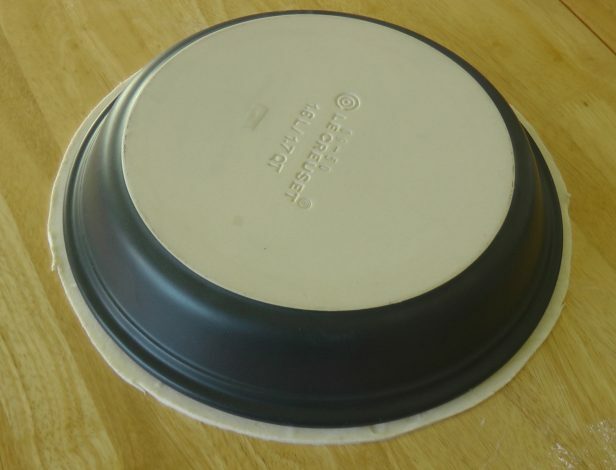 We strongly suggest that you don't buy the ready rolled type unless you are very sure it will fit the dimensions of your pie dish. Because if the pastry is not wide enough then it will be wasted. 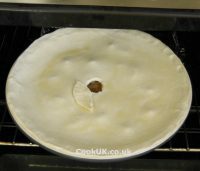 Instead use a 500g block of ready made puff pastry which can be rolled out to fit your pie dish. 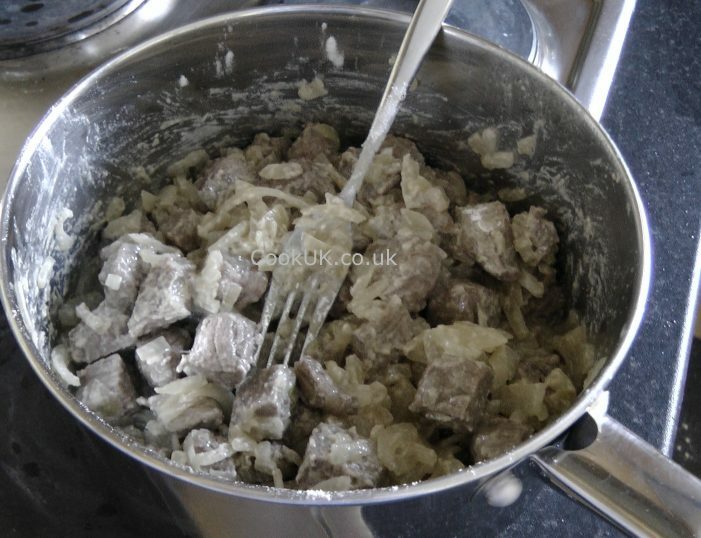 The steak and kidney filling is prepared and cooked by itself at first. One of the tricks of a good steak and kidney pie is to get the beef so that it falls apart when eaten. It's not difficult to do this, simply cook it slowly for longer than most other recipes suggest. Not only will the beef be extra tender but the flavours will mature marvellously. Now to the all important gravy. It should be thick and full of flavour. Slow cooking the beef in stock and beer will form the basis of a good gravy. 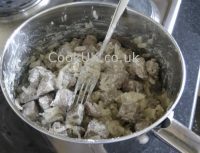 The addition of flour will give the gravy a basic thickness which can then be adjusted towards the end of the cooking time. The sauce can be thickened further by sprinkling in flour, a little at a time. But the best way to thicken and add flavour to our steak and kidney gravy is to add gravy granules - we use Bisto. This gives perfect results and you can make the gravy as thick as you want as long as you add the granules slowly and stir in well. Our recipe uses ox kidney and we believe this is the best kidney for the pie. But feel free to use whatever kidneys you want, lamb's kidneys are a good alternative. The cooking method remains the same whatever kidneys you use. If you buy kidneys from the supermarket they will normally be prepared ready for cooking. If you buy them from your butcher then ask him to prepare them for you. If you need to prepare the kidneys yourself then the basic idea is first to remove the membrane surrounding each kidney. Cut the kidney in half and then carefully cut out the fatty white tissue from the centre. This is a fiddly job and that's why we suggest you buy prepared kidneys. Finally to added ingredients. 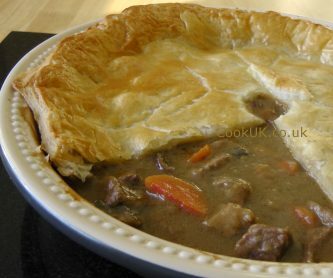 The pie can be made without the carrots and mushrooms suggested in our recipe below. However we believe they add texture and flavour to the pie. They also bulk it out relatively cheaply reducing the amount of expensive meat which is required. Add two tablespoons of the oil to a pan on a medium heat. When heated add the steak cubes and fry them for a few minutes, turning them often, until they are browned. Remove the steak from the pan and add the onions. Fry for eight minutes, turning them often, until they are softened but not browned. Add the steak back into the pan and then sprinkle on the flour. Mix the flour into the ingredients. Add the beef stock and beer into the pan, mix all the ingredients thoroughly and then simmer gently for 1 hour 45 minutes. Five minutes before the steak has finished cooking, add the remaining tablespoon of olive oil to a frying pan on a medium heat. Ad the cubed kidneys and fry for a few minutes, turning them frequently until they are browned. Preheat the oven to 200°C / 400°F / Gas Mark 6 (slightly lower for fan-assisted ovens). Add all the ingredients, including the kidneys but not the pastry, to the steak in the pan and mix well. Simmer the steak and kidney pie filling for forty five minutes. While the filling is cooking roll out the puff pastry to about 3 to 4mm / ¼in thick. Sprinkle some flour over the flat surface and on the rolling pin while you are doing this. Place your pie dish over the pastry to mark it then cut the pastry about 2cm wider compared to the pie dish. Cut a small hole in the centre of the pastry to allow steam to escape during cooking. When the filling has cooked, take it off the heat and allow it to cool for 15 minutes. Then transfer the filling evenly to the pie dish. Drape the pastry over the edges of the pie dish and firm the edges down. Mix the egg white and yolk then brush the mixture over the top of the pastry. This will give the pastry a beautiful golden brown colour during cooking. 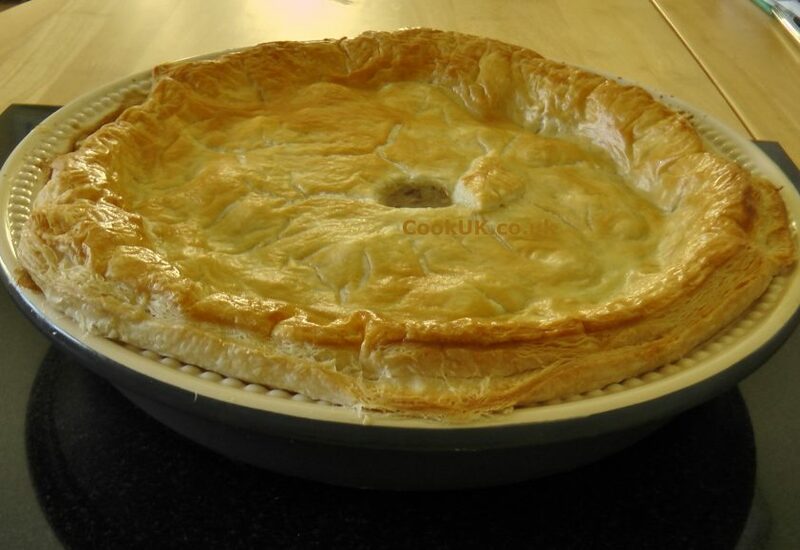 Place the steak and kidney pie in the pre-heated oven and leave it to cook for 20 minutes. Take a look at the pie and if the pastry is golden brown then it is cooked. If not leave it in the oven for another five minutes and check again.